You know what is kind of lonely? The reference desk on a stormy Saturday in May. I’ve had 7 questions since noon. I’m feeling better about work these days – there are still definitely moments when I feel frustrated, overwhelmed, and totally unqualified, but there have been many others where I feel like I can contribute to the conversation in a significant way. We continue to hire bright, sharp, forward-thinking individuals, and that gives me hope for substantive changes in the near future. Three individuals with whom I work closely are leaving in the near future or have left already, and that makes things hard – but I’m hopeful that we’ll hire fantastic people to replace them, and that the new folks will bring interesting perspectives and good ideas to add to the fray. Right now we’re hard at work wrapping up our Facebook study, which was accepted for the RUSA Reference Renaissance conference in August. I’m hoping that we’ll be able to build on this study in interesting ways, although we’re already moving on to the next project, with a third in the wings for fall. I’m taking advantage of my six hours on the desk to wrap up this lit review, and get started on the next one. Hooray for self-directed research that directly informs practice. I haven’t posted here about Project Bamboo, but that’s not for lack of thinking about it. Basically, it’s just that – a bunch of technologists, librarians, and faculty members in the arts and humanities getting together to brainstorm the possible. GW is interested in getting involved, so I attended on behalf of my library. It was an overwhelming, challenging, invigorating experience, despite the fact that I felt very young and green amongst the university librarians, the CIOs, and the tenured faculty members. Bamboo offers a really exciting opportunity for all the stakeholders in the process to be involved, and to collectively develop something – a tool, a tool set, a development environment, a network – that will be mutually beneficial, facilitating discovery, collaboration, and advocacy for research in the humanities. Over the course of the workshops we talked about the need for change in promotion and tenure processes in the humanities to recognize collaborative, “tool-building”, and digital work. We talked about transformation versus improvement in research practices. We talked about smashing boundaries between faculty, staff, and students – between disciplines – between the public and the academy – to encourage more authentic collaboration and feedback. It was tremendously exciting to be sitting on a bus with people from all over the country – and for them to be so excited about what we were working on that the chatter was deafening. On the final day, the CIO of the University of Chicago framed the discussion in terms of “I’m OK, you’re OK.” He said that we’ve gone through many iterations of this relationship over the years. We have said to those doing research or using technology in different or unfamiliar ways: “I’m OK, you’re not OK.” We’ve said “I’m not OK, you’re OK” in situations where we’ve felt overwhelmed by the technology or the process. We’ve also said “I’m not OK, you’re not OK” in situations where we’ve been asked to collaborate with others, but just haven’t spoken the same language. Bamboo offers an opportunity to say “I’m OK, you’re OK” in the context of a respectful partnership. Regardless of what GW ends up doing, I’m terribly excited to see what happens with Bamboo, and delighted that I was able to be a part of the process. I harvested and froze the cilantro – if it doesn’t grow back, we’ll dig it up and put something else in its spot. The lettuce is nearing the point of microgreens, so we plan to thin it this weekend. The onions are sending up shoots of green – I planted them on a whim without being responsible and starting them indoors 60 days ahead of time. I figure if by the end of the summer we have onions, awesome. If not, I’m out about $1 in seeds. Scrambled eggs with chard for breakfast – Mina liked the chard! Farmers’ market strawberries used in homemade ice cream – our first batch with the new Cuisinart was amazing. I’m taking two summer classes, so from now until the end of June our culinary experiments will be primarily in Shane’s hands. I told Shane last night that all this reading about local food (Plenty, Food Politics, The Farm to Table Cookbook) has me really excited about the change of seasons, the wonderful diversity of food options that will be available in a few weeks, and reaping the benefits of this diversity and surplus to provide for meals many months in the future via canning, freezing, making jam, etc. I’m especially excited and hopeful that there will be more aha! moments with food, where we both will discover that things we thought we didn’t like we didn’t like just because we’d only known the pale supermarket version. And with that, off to the market! I realized this morning as I made our weekend coffee that we’ve had our Chemex for one year! Well, not this particular Chemex (there was an incident with a broken spout), but a Chemex rather than a conventional drip coffeemaker. 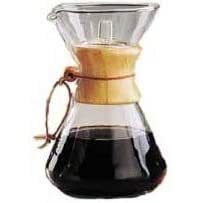 While there are certainly times that I miss the convenience of a drip coffeemaker with a timer and all of that – in general the quality of coffee from the Chemex wins out. Cilantro is bolting – we need to decide whether we’re going to harvest the cilantro, or let it go to coriander. Maybe some of both. Tomatoes totally beat up by 40-50mph winds and driving rain. I think the chopstick split plus a timely move inside may have been enough to save them. One more strawberry that unfortunately rotted on the vine – we were hoping it’d get bigger. *sigh* Two more in the works! I missed the market this week because I was in Chicago Wednesday-Sunday – Shane picked up more eggs (oh so worth the extra money), more asparagus, more strawberries, etc. On my flight to Chicago, I read Plenty: One Man, One Woman, and a Raucous Year of Eating Locally which, while annoyingly upbeat at times, was overall a good, easy to read account of eating based on the seasons and the region. By the end of the year, the authors said that their enjoyment of food had increased while their cravings (in general) decreased – they were satisfied with less because it was simply better. I’m calling it Spring Farmers’ Market soup, or: using up stuff from the fridge before it goes bad. With each bite we could taste the flavors of the different veggies – cherry tomatoes, spring onions, asparagus – infusing the broth. I also enriched (a la Giada) the stock with a hunk of parmesan rind long hidden in the freezer. A perfect meal for the last in a series of rainy, grey days. It’s been raining since Wednesday, with few interruptions. My poor garden is taking a beating, but I think it’ll survive. Another red, ripe strawberry is waiting for me to brave the rain to retrieve it. One week off from coursework, and then I start my two summer classes: Qualitative and Quantitative Methods, both taken at GW. I should also be starting my thesis research, but I’m giving myself a few more weeks before tackling that beast. Today we slept in and skipped church, instead running errands and making brunch for friends out of mostly-local ingredients. I feel a little ick now, but for the most part I’ve been feeling way better with less food guilt (physically and otherwise). Many congrats to my GSLIS friends who graduated today! I meant to tune in to virtual graduation, but we got busy with brunch and forgot. My apologies. On Wednesday I fly to Chicago for four days for a meeting. I’m hoping to catch up with Keem and El while I’m there. Too many friends, not enough time, as always.